Why Won't My Heater Work? Why Won’t My Heater Work? Every owner of a pickup truck dreads discovering that the heater in their vehicle is not working. This realization is especially dreadful if the weather is cold and the temperature is not rising any time soon. 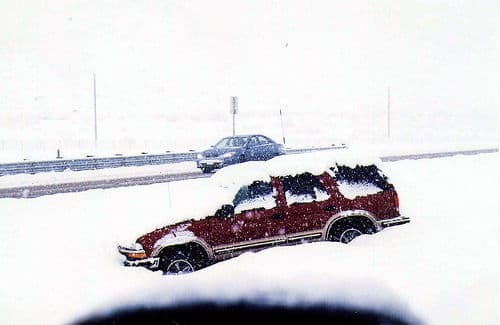 Before you know it, you are driving around in an uncomfortably chilly vehicle asking yourself, “ Why won’t my heater work?” Luckily there are answers to that question depending on your particular situation. Here are the reasons why the heater in your pickup truck may not work. If you find that your engine temperature gauge is higher than normal but your heater is not working, this is likely a result of a restriction in the cooling system. Restrictions within the cooling system are often caused by a thermostat that remains in the closed position. This problem should be addressed immediately because restrictions in the cooling system can cause the engine to overheat. For those who find that the temperature gauge on your engine is normal but there is no heat, debris may be restricting the heater’s core. A common cause of debris is using an excessive amount of a stop leak product to address another issue. In order to fix this problem, the cooling system may need to be flushed. Other causes of a heater not working in a pickup truck include an inefficient water pump, poor heater operation or failed hot/cold temperature blend doors. Signs of these problems include the heater only working when car is in motion, an engine that never warms up or no problems can be found within your heating system. Luckily, all these problems can be addressed and have the heater in your pickup truck working in no time. Overall, there are several reasons why your heater will not work. Depending on your exact problem, there can be a range of causes. These causes can be anything from restrictions within the cooling system to failed hot/cold temperature blend doors. Luckily, these problems can be repaired and regular maintenance is great at preventing some of these common issues. If you have a heater that is not functioning properly having it repaired immediately is always suggested.